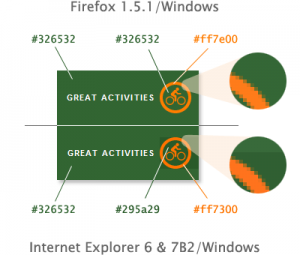 I am well-aware of the issues regarding IEs handling of alpha transparency in 24-bit PNGs, but had not heard of any color-related issues with 8-bit PNGs in IE6. I did a test in IE7B2 to see if the error was there too and it was. I did some searching on Google and couldnt seem to find any documentation on this bug, but its certainly something Id recommend they fix for the final release of IE7. For now, however, the only solutions appear to be adding color-correction to your CSS for IE (if you are dead-set on using an 8-bit PNG) or using a GIF.